A funny friend loaned me this funny book two weeks ago. 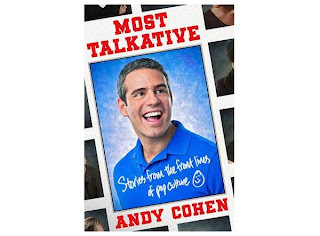 I felt inclined to write a small review of Most Talkative: Stories from the Front Lines of Pop Culture since I have so many "Housewives friends" and Andy Cohen is creator of all things 'Real Housewives'. Andy just gets it. He's relatable, he's goofy, and he promotes social drinking like no other; therefore, I'm an Andy-olic. I just made that up, but I think there needs to be a groupie name for all the females loving this guy right now. Similar to what the Joan Rangers are to Joan Rivers, which I consider myself to be although I have never formally joined any Joan Ranger membership club like back in the grade school days of mail-in membership clubs to our favorite pop idols. I'm assuming it's similar but through the-ever-annoying-Facebook or Twitter. 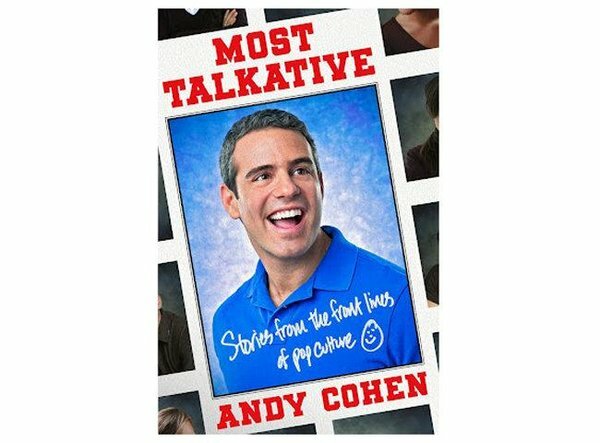 Most Talkative is like hanging out with Andy, which I'm so dying to do. I'm super hoping my next girls trip is to visit the Bravo Clubhouse. It's candid, funny, and gave great insight into how he got to where he is today. There are sections of the book where I was seriously laughing out loud reading in bed. The husb got a little feisty with me once when I woke him up with my giggles, but I can't resist a good laugh from a gay man telling about his obsession with All My Children, going into detail about his Jew-fro fighting humidity (I can so relate to that), and reading his letters home from camp begging to get the hell out that place. One of my favorite stories is early on in the book starting on page 19 when Andy talks about his family's housekeeper Kattie a.k.a. Blouse. I don't know why, but Blouse is the funniest freakin' nickname to me! It's like I can just see Andy following Blouse around their house bugging the crap out of her while she cleaned up after him. The post-it notes he includes in the book are a hoot too. I mean who keeps stuff like that?? Well, I for one. I still have a shoebox full of middle school notes passed during class and signs that were hung on my locker on my birthday. Yes, I'm a pack rat. So I can relate to another pack rat. I mean, just look at the Bravo Clubhouse. That tells you that Andy just likes...stuff. Me too. Back to the book. I really enjoyed reading the little he wrote about his upbringing. He said that he didn't like reading about other people's childhoods so he wasn't going to go too in-depth into his. I, for one, LOVED reading about it. For one, he's a fellow Midwesterner! Secondly, he's just so damn funny about how he tells his past. The chapter about coming into his gayness was kinda sad. I just feel bad that people that are so well-liked and can be so outgoing still have to feel timid to tell the people most important to them that they are gay. It shouldn't have to be that way and I definitely think we have come a long way from when Andy was 20 and having to go through this thankfully. I found his background in television producing intriguing. I had no idea he had so much experience in the industry! I always wondered how he got to be where he is today hosting, producing, etc and Most Talkative really gives great insight to him starting out as an intern and working through the ranks at CBS. I do have more respect for him as a journalist after reading this book. Before I thought maybe he just knew the right people at the right time and slid his way into that blue club chair drink in hand. But no, he did the dirty grunt work of interning, which led him down a successful path of celebrity-dom. In some respect, his story reminds me of Giuliana Rancic. They both majored in communications/journalism, went for their dreams of working in television with celebrities and look where they are today? Pretty inspiring. Well, I'm sure by now if there are still any readers on this post (which I never write this much-weird!) you should probably just go ahead and read the book if you haven't. His relationships. Has he had any serious ones?? I want to some funny dating stories. I'm sure he has them. He gave some early 20's fling bits, but I want to hear more. How the Housewives get paid. Who determines who gets more money than another housewife on the same show? Is it common knowledge among the housewives? I'm sure that would cause some jealousy if so. Does Ramona ever drive him up the flippin' wall like she does everyone else???? How does he take her?!? Overall, a quick read that will have you laughing out loud and possibly at the expense of your spouse's zzzzzzzz's. P.S. I've never done a book review on Shemmy Shemmy Shake Shake. I follow no guides and know this one jumps all over the place. Plus, I finished the book a week ago so I'm trying to remember my favorite parts without really going back through the book. Great review Brooke! I don't think I would have a clue what he was talking about though cause I don't ever watch the housewives. They make me angry. However, he does seem hilarious and I love a good funny gay man story! Love it! I am totally purchasing this for Jimmie for Christmas and then borrowing it. The two may not be able to be in the same room and could battle for "most talkative"